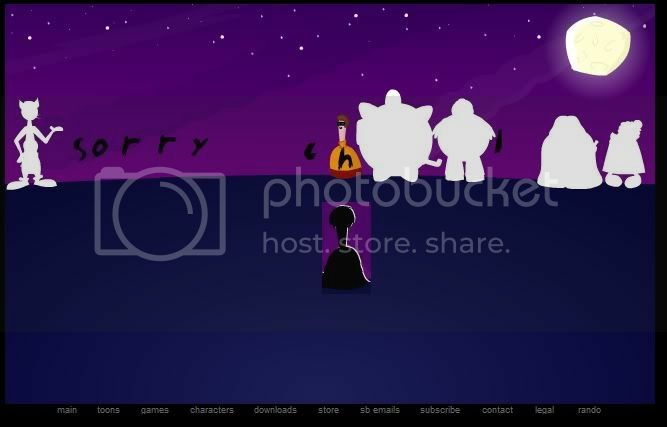 http://www.homestarrunner.com/ween09_teaser.html, because I still don't know how to hide the URL name. Looks like the Bros. did a great job finding the costumes (save Strong Bad's, yet again), and we can't easily recognize them until they're unsilhouetted later on this week. Anyone care to guess? I believe might be a cat character. YES!!! My prediction was right...sort of...I dunno, maybe he'll be something from DOOM, maybe not. I have a suspicion that the toon will not be released until around Friday (the 30th). By then, I will on my way to or be in Las Vegas for a wedding and may or may not be able to access the website. I won't be returning until Nov. 1. As for who is dressed as what, I can't even begin to hazard a guess. Hey, by the way, can we merge this thread with the Halloween '09 thread, please? Is definatly George Washington. He's got the powdered wig and cravat in the silhouette. Re natendo64: That's totally a robocop silhouette (i think). Doomguy looks different. Anyway - when the page loaded for the first time, my computer lagged a little and I was able to see... something. Some experimenting with quick refresh/printscreen combo gave me a picture with Coach Z, Pom-Pom, SS, KOT and Homsar silhouetted in white (the others didn't load yet, presumably), and Marzipan fully loaded and in colour! There is also a partially loaded message, probably meant for people decompiling the thing. "Sorry___ch____l". The rest of the letters didn't load yet as well. I'd say there can be 3-4 letters between the ch and l, two could fit after the Sorry as well. I couldn't come up with anything better - maybe somebody can shed more light on this by decompiling. Maybe even that Marzipan's costume is a red herring, since I can't seem to even glimpse any other costumes, jsut white silhouettes. Last edited by CaptainPastHisPrime on Mon Oct 26, 2009 3:24 pm, edited 1 time in total. Right, I thought it was from the sketchbook, but it makes sense they reused one they already made in flash. I believe that Marzipan costume was a rejected one from earlier years. That's right. You can go here to see what they mean by that: http://www.hrwiki.org/wiki/Rejected_Costumes. is probably a Goron. I think those are spines on his back. 's appears to be some sort of car character... a rectangle in the front, tailpipe in the back. Failing that, maybe a piggy bank. Also, these are not really guesses, but 's shoes appear to be in the Disney style (though those might just be rings around his ankles), 's some sort of old guy, is wearing heels, and a quiver of arrows is visible behind . It says that the King of Town is dressed as Sonny Crockett from "Miami Vice". Maybe that's who he'll be in the actual toon, I hope? ...Nah, can't be. Again, the picture and the silhouette don't match. But can we please merge this thread with this one, like last year? That would be the Halloween 2009 discussion thread, like so: http://forum.hrwiki.org/viewtopic.php?f=4&t=14832. Last edited by CaptainPastHisPrime on Mon Oct 26, 2009 5:29 pm, edited 1 time in total. The Poopsmith was already Doc Brown. Maybe Bubs is... Red Green...? I also think I know who Homestar is: Austin Powers!!! Look at the costume really closely and you tell me if it doesn't look like it! I also hope that Marzipan dresses as a female this year. She hasn't done so since 2006. Carl from Aquateen Hunger force? Homsar is one of the members of Devo from the "Whip It" film clip. I have to agree that Strong Bad is Robocop. Strong Mad is the character from "Money for Nothing" by Dire Straits. The hat would be at a weird angle, but he does have the mitts, so who knows? I also second the Strong Sad being Mega Man, and The Cheat kind of looks like a walrus or seal to me. I was thinking a Pokemon of some sort. Are there any cat rappers? Maybe Homsar is Bozo the Clown? Catwoman? Though I have no idea how that would relate to rap at all. His legs are rounder than usual...and his head is more like a half circle....Homer simpson? For some reason my gut says Frankenstein. A member of "Paul Revere and the Raiders"
Random debris sticking out of him...Zombie? And as for , well, chances are I'm 3000% wrong, but this picture caught my eye. Coincidence? More than likely! But I'm stickin' to it. Naw. Strong Sad was already Devo a couple of years ago.